From pasta to salad to chicken and more, cheese is a delicious accent to just about any meal. This durable glass Shaker can hold 14 ounces of grated cheese or even crushed Red pepper. The tightly sealed top has holes big enough for crushed reds, but small enough to evenly distribute grated cheese while shaking. This cheese Shaker is ideal for restaurants, especially pizzerias and other Italian establishments, and makes for nice presentation at home with the "old fashioned" vintage labeling adding rustic appeal to the decor. 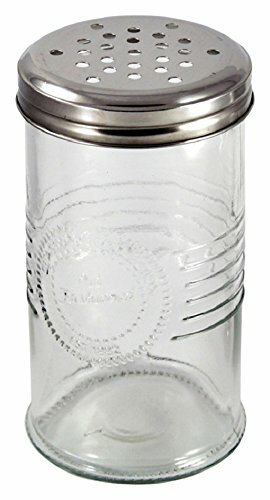 The jar measures 3 inches in diameter by 5-1/4 inches tall and has a 14 Ounce Capacity. If you have any questions about this product by Grant Howard, contact us by completing and submitting the form below. If you are looking for a specif part number, please include it with your message.